The Six Senses in a Nutshell: Demonstrated Transitions from Bleak to Bold Narrative by Jessica Bell is the latest writing craft book in the "Nutshell" series. We've reviewed the others, too: Show & Tell in a Nutshell and Adverbs & Cliches in a Nutshell. The latest installment in the series is another helpful book for fiction writers and covers a topic we must all think about while writing: using sensory details in our description. Jessica begins by reminding writers why she wrote these books and how they can help writers with their craft. "But it [the Nutshell series] will help you to realize that you can, little by little, end up with a brilliant piece of work." The other thing she explains to us is the SIX senses. Many of you are probably wondering where the sixth sense comes in--especially if you've seen the movie with Bruce Willis. The six senses that Jessica includes in her book are: sight, hearing, smell, taste, touch, and . . . instinct. Finally, she explains the best way to use the book to improve your own writing. Each of the "transitions" (sections) of the book introduce a BLEAK passage, or one without sensory detail. Then she wants readers/writers to write their own BOLD passage, one full of sensory detail. She also warns not to use the actual sense words too much, such as smell or see--be creative when you are working sensory details into your writing. After you write your own BOLD passage, Jessica shows you one of her own. Then she has a section after each of the BOLD passages called: "Which Senses Have Been Used and How?" During this part of each transition, she explains the sensory details in the BOLD passage to show how details can be embedded into the narrative AND how to show details instead of telling them. She encourages you to go back and revise your own BOLD passage after reading her example and explanation. The print book has note pages for you to record your thoughts. Here's part of Jessica's BLEAK example: "She didn’t want to go inside. Especially since he was home. She could hear him playing computer games. The sound of cars, and his frustration, came wafting out the open window. Suddenly he switched off the game. Samantha quietly stepped inside and left her briefcase by the door hoping her son might get nosey, take a peek inside, and find her journal." Here's MY ATTEMPT at making it BOLD: "Samantha shut her eyes and took a deep breath, before turning the knob of her front door. Her son yelled profanities at the video game he was playing--if she didn't know better, she would have thought her house had been converted into a race track. 'Damn it,' he said again, and suddenly, the electronic cars stopped their incessant whirring. One more deep breath, and Samantha tiptoed inside, leaving her briefcase with her personal journal inside near the front door. Maybe her son would actually care and snoop inside her briefcase." Here's what Jessica shared for this part of Transition 4 in her BOLD example: "She didn’t want to go inside. She never wanted to go inside. He’d be waiting for her, ready to pounce, either with degrading comments or silence; she didn’t know which one was worse. But she’s got to stop doing this. Working late every night wouldn’t fix the relationship between them. It wouldn’t fix him. As she inserted her key, the sound of a car screeching and crashing leaped from the open living room window. He’d left the fly-wire off. Again. Something fell to the floor and thick thuds followed—a bit of bookcase abuse, perhaps. The roar of the digital explosion stopped abruptly. Perhaps he’d turned off the TV." This is a fun writing how-to book because Jessica makes you think, write, study, learn, and improve. It's like a writing workshop in a book for under $5.00, too! All together, there are 11 transitions to work on, as well as a final page called, "Now What? ", where Jessica issues you another writing prompt and encourages you to e-mail her your best one when you are finished. If you want another example of what is in The Six Senses In a Nutshell, then go to our Facebook page, click on Notes, and read the writing prompt note about this book. If you want to win your own copy, then look below and use the Rafflecopter form to enter! Happy writing--and use those sensory details while you do it with Jessica's help. 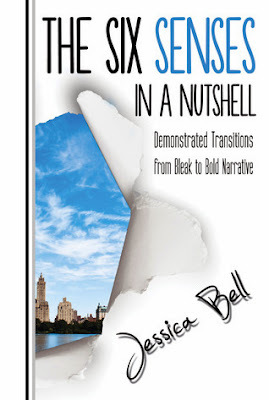 Enter the Rafflecopter giveaway below for a chance to win a copy of The Six Senses In a Nutshell: Demonstrated Transitions from Bleak to Bold Narrative. This is one you'll want to add to your writer's reference bookshelf! Thank you so much! So pleased you did one of the exercises. Fabulous! I sometimes find it hard to use the sense of hearing in my writing. This book would be insightful especially since it includes the hands on exercises. Thanks for sharing the information! Excellent review, Margo! I'm working through the exercises right now and find them challenging to do and so much fun. Applause to Jessica! The Six Senses is a fantastic addition to In a Nutshell series! Sounds like a great book! Enjoyed reading the post. Love the examples. Those are always helpful! I have problems with including all the senses when I'm writing. The toughest ones for me are taste and hearing. Looks like a this book will be a huge help with all of the senses and a must have. Good post and reminder to use all of the senses, including instinct. Look forward to reading this book. I don't necessarily forget to use the sense, but i forget to incorporate more than one so they mesh more convincingly.